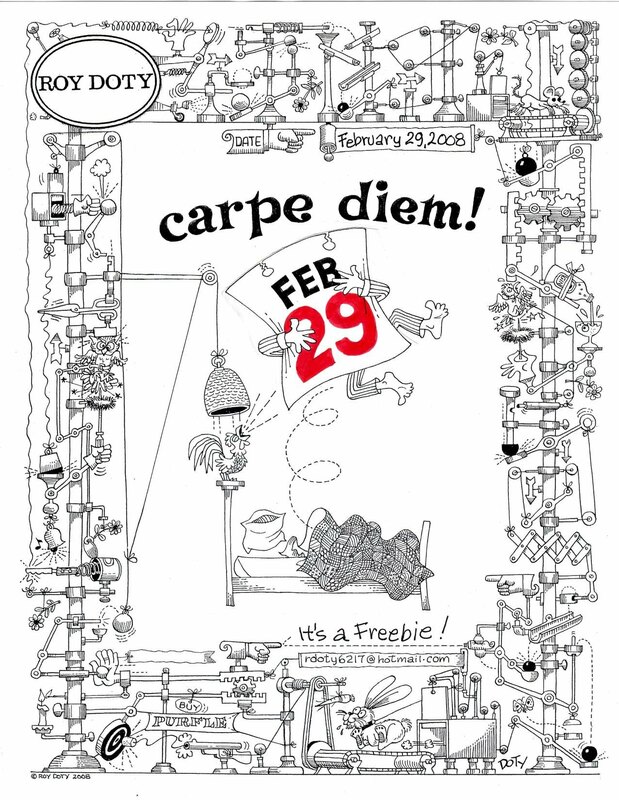 Roy's Doty's Leap Year card -- Carpe Diem! Roy Doty has been illustrating books and magazines since the 1940s. I first came across his work around 1970 when I acquired an old stack of Popular Science magazines from the 1950s. He did (and still does) a regular comic strip called "Wordless Workshop," which showed you how to make something cool without using any words to describe how. That's difficult to pull off, but Doty's clear and precise drawing style was (and is) up to the task. When we started MAKE in 2004, I was overjoyed to learn that Doty was still illustrating. I wrote him and asked if he'd like to illustrate our puzzle page. When he said yes, it was a dream come true. To celebrate Leap Year, Doty sent out this delightful card of a Rube Goldberg-style machine designed to get you out of bed. Doty sends out a card for nearly every season and holiday. I think it's because he finds a lot of joy in life.